WASHINGTON (PAI) — Nine years after the AFL-CIO formally filed its charges, an arbitration panel has bounced the federation’s detailed, evidence-backed complaint, which the U.S. took up, that Guatemala violates the labor conditions promises it made under the CAFTA “free trade” pact. The arbitrators’ ruling, which came after the U.S. Labor Department – under then-President Barack Obama – tried and failed to settle the mess, galled Celeste Drake, the federation’s specialist in such free trade pacts. “This decision drives home the fact that U.S. trade deals do not protect workers. In truth, this failure is by design. Labor chapters” in such trade pacts “were not meant to work efficiently or effectively,” she said. The arbitrators’ ruling for Guatemala is important because it was one of the first brought – and the first to reach a decision – under labor sections of such trade pacts. The CAFTA pact had mediation and then arbitration written into its text, but not guaranteed enforcement. Other trade pacts have only non-binding labor “side letters” which the signer nations can ignore. Guatemala’s worker rights record is so bad, a U.S. Commerce Department report adds, that only 1 percent of its private sector workers are unionized. 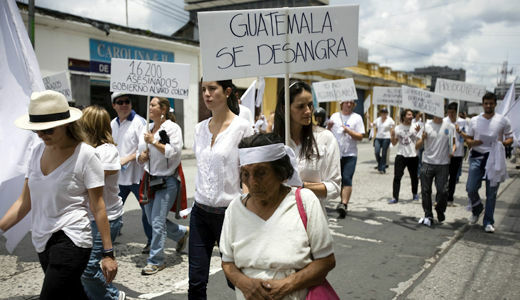 The Guatemalan Labor Ministry must approve all union contracts, and it approved only six last year, Commerce added. Guatemalan unions – and union leaders – need government permission to operate or to hold those jobs, that report explained. “Meanwhile, employers in Guatemala routinely fire and intimidate workers when they attempt to form a union, refuse to bargain in good faith and fail to pay workers what they are owed,” Drake said. “For example, three trade unionists were assassinated last year. Workers at the metal company Ternium have been trying to negotiate a contract since 2013, and the employer has refused to come to the table. Bimbo fired 150 workers for union membership and has simply not complied with a court order mandating reinstatement. The AFL-CIO and its Guatemalan allies documented numerous worker rights violations in the small and poor Central American nation, in presenting evidence to the arbitrators. They included 83 murders of unionists since CAFTA took effect, “with the vast majority of cases going uninvestigated and unsolved,” plus “profound corruption by illegal security forces and clandestine armies who prey on workers” and other dissenters. Guatemala’s “failure to protect the fundamental right of freedom of association, and persistent, serious human rights violations” led the United Nations to open a special investigative office there, the fed said. CAFTA also lacked a mandatory deadline to settle the mess, Drake added. “As in this case, governments can and do sit on complaints for years. Meanwhile, evidence spoils, witnesses disappear and petitioners lose hope…The legal maxim ‘justice delayed is justice denied’ is especially fitting here.” That’s the case with other trade pacts, too, she noted. “Even if the United States had prevailed, any changes in Guatemalan labor policy would come far too late for the workers who have lost not only their jobs, but in some cases their lives, in the struggle to simply exercise their rights,” Drake concluded.